A modern take on the sheepskin fly patch. This 3.5" x 2" fly patch has ripple foam to hold the flies and a plastic clip that'll fix securely to a pocket flap or jacket collar. The back of the Fulling Mill fly patch has diagrams for 3 simple but effective fisherman's knots. 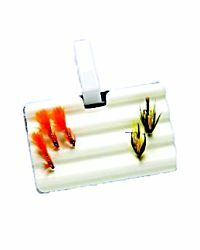 To use the Fulling Mill Foam Fly Patch, simply clip to a convenient spot on your fishing waistcoat or jacket and then hook all your flies on after use. This lets the flies dry out naturally and also keeps them handy for when you next want to use them. The clip is not strong enough to retain the patch on clothing.